Have you decided to start a blog and committed to updating it regularly but not sure what to write about? You are not alone! I’ve been blogging for a few years now but there are still days when I feel that I wish a had a list of ideas to refer to, just get me writing. Thus, I decided to put one together and share it with you! Firstly, let me mention that the most important things about blogging is not only the content but also the consistency of the updates. Establish the schedule that you have time for – 2-3 times a week is a great start. The time when to post is important too. Posting them constantly in the morning or in the evening is great as the readers know when they will find a new post to read. I LOVE posting and looking at the behind the scenes shots of other creatives. Nothing like a little nosey around the creative space! This topic is awesome as you can post updates when you re-decorate or tidy up the space and send new readers to see your space every now and then on Facebook. Please don’t get shy that it’s just a kitchen table or a part of the living room. It doesn’t really matter as that’s where your creations are born. It doesn’t have to be super tidy either, all creative spaces are messy so you can also post before and after shots, show what it’s really like during busy times! It might be because I am a curious creature but that’s what excites me even more then seeing the finished item – seeing it coming to life! There is nothing like building the excitement, showing what you are making as it happens. If you prefer to keep item a secret before the release, post “How it was made” post after, no problem. Just remember to take the pictures. So, you are blogging about your space and what you make. 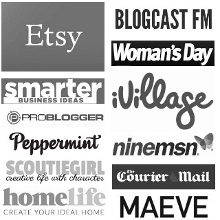 This topics are endless really as you make things regularly and have new creations to blog about. However, the blog comes to life when you inject a bit of you in it. What you like, your interests and your life. The Linkin parties are great as they give you a topic to write about so all you need is to go with it. Another great thing about those parties is that you leave your link on the blog that hosts the party so other readers will come in to check your post out. You also need to stop by and comment on other post as it’s primarily sharing and discovering new blogs which is always fun! Wordless Wednesday, held at The Jenny Evolution – share a picture of your garden, new creation, a dog/cat or a flower something that is cute/inspiring/celebrating everyday moments. Sunday snippets, held over at The Beetle Shack – It’s a new one that I am joining this month. You need to post a couple of pictures from your week, little moments that made it memorable. Very easy theme and I love looking at all the pictures, very inspiring. Photo a day challenge at Fat Mum Slim – if you like Instagram, this one is for you. I am yet to join this one… next month! My creative space at Villagevoices (This site/resource is no longer available) – show what you are working on and see other creatives in action! Great theme that I’ve been joining in for years. Did you go to a craft show, sew together, crochet class recently, then tell readers all about it! You can always spot a blogger as we take pictures of everything so don’t forget your camera. Write about a book you are reading, why you bought it and how you are liking it so far. Great way to share you interests and ask readers to recommend you a next book to read. Do you baking or cooking? Why not share your best recipes every month? Storage is always a problem so show how you store your craft supplies, it might be very helpful to your readers or ask for tips if you are struggling to find ways to store certain things. Round-up the most popular pins or your favourites ones, maybe some seasonal items or colour coordinated inspirations. This will tell your readers what your like, your taste, and send them to your Pinterest page. I fell in love with Instagram as soon as I started using it! Great way to connect and see what others are creating. It’s a wonderful collection of pictures ready to be arranged into a post. What did you do? Where did you go? What did you see? Idea #10 Blog about your kids. If you are comfortable with sharing pictures of your kids in the blog, do so once a week. Funny or sweet moments of your everyday routine is a great way to capture their growing personalities! Every holiday season needs one of these posts! I love putting together gift ideas at Christmas/Easter. It can be something from your store matched together in bundles or items made by your fellow sellers on Madeit/Etsy. Don’t forget to let them know that you featured their item. Who doesn’t like getting to know new handmade designers and their stories? Great way to network and get to know them better. You can even exchange interviews, why not?! I find these type of post to be the hardest to write but the most rewarding! They get the most clicks on my blog and I love seeing items created by following my tutorials. DIY doesn’t have to be complicated, I find the easier the project the more popular it is as it can be made quickly. Have a look at your Facebook updates and see if you can make a summary of your week in one post, it’s a great way to record a week of happenings and refer your newsletter readers there. Even if they follow you on Facebook, they will appreciate a quick sum up so they don’t miss out on what’s coming up or a special offer. When you feel comfortable with blogging and writing, consider contributing to other blogs as being a guest blogger is fun and it opens a new audience to you. Blog owners always on the lookout for contributors, including me *wink* but make sure you send a ready to cut and paste blog post with relative content for a better chance to get featured. Finally, Allocate topics to the days of the week so you have a routine to follow. Wednesday – wordless post, sharing a beautiful picture that made you smile. When you look at the days and topics allocated, blogging is not as scary, is it? If you still think that there is nothing you can blog about in your day, take a moment and write down what you did today. Everything from laundry to quick coffee with a friend and you’ll see that there are plenty of moments that are worth capturing and sharing. Even just a picture of your messy and wildly creative space is interesting to the reader as that’s what they want to know. It’s all about sharing who you are, what you do, and why… and that you are a human being behind a handmade business. Last but not least, every now and then, after your routine is set up, experiment, find new things to blog about to keep it interesting for yourself and readers. You don’t have to set everything in stone, we are creatives after all – spontaneous people! Do you have a pool of topics that you use to help you keep your blog rolling? Share them with us in the comments.